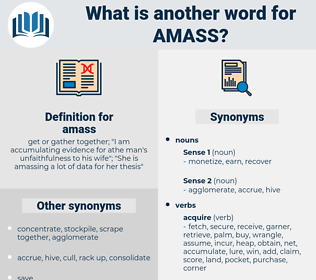 What is another word for amass? get or gather together; " I am accumulating evidence for athe man's unfaithfulness to his wife"; " She is amassing a lot of data for her thesis"
Learnt, firing, assemble, collect, collate, stockpile, mobilize, accrue, compile, muster, raise, obtain, acquire, congregate, garner, consolidate, rally, summon, convene, earn, build. dissipate, disperse, disburse, divide, spend, separate, dole, scatter. Fourth, said Anthony Wallner: Every innkeeper must strive to amass provisions, forage, wine, and ammunition; for the inns in the mountains are, as it were, small fortresses for the Tyrolese, and the enemy can reach them only slowly and after surmounting a great many difficulties. If the latter, the truth that we amass here does not exist after death, and all our struggle to gain a possession that may follow us even to the grave is in vain. 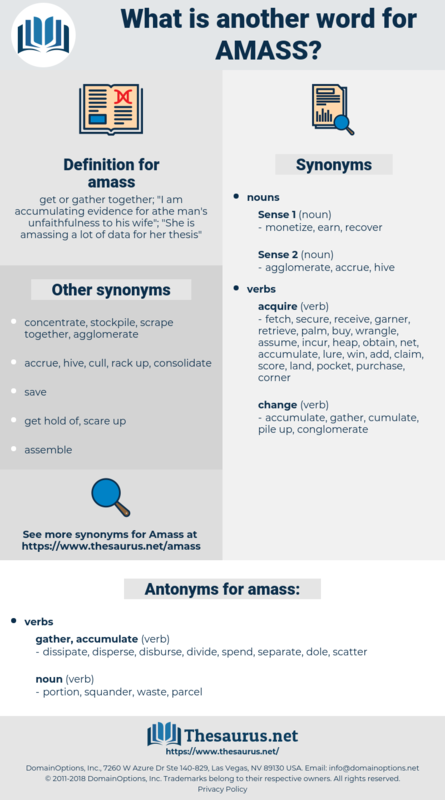 amiss, amok, amnic, anasazi, amnionic, amnesic, annex, Amos, anoxia, amnesia, anhinga, annoyance, aminic, Ankus, anagoge, awing, anagogic, anchusa, ans, anguis, Anzio, ananas, anionic, ammoniac, amnesiac, anoxic, anamnesis, anechoic, anonymous, anunnaki, Angus Og, aeneas, amex, ananias, animize, anjou, animus, anise, amuse, amaze, angus, annamese, anomic, amanuensis, amuck, ANG, announce, annonaceae, amigo, amnios, anxious, annexe, animise, annoying, ANZAC, amyxia, ahimsa, anise cookie, aengus, anemic, anas, anaemic, angas, awayness, amish, annexa, anguish, anasa, awning.